Dark corn syrup in commercial packaging. Historically, corn syrup was produced by combining corn starch with dilute hydrochloric acid, and then heating the mixture under pressure. The process was invented by the German chemist Gottlieb Kirchhoff in 1812. Currently, corn syrup is obtained through a multi-step bioprocess. First, the enzyme α-amylase is added to a mixture of corn starch and water. α-amylase is secreted by various species of the bacterium genus Bacillus and the enzyme is isolated from the liquid in which the bacteria were grown. The enzyme breaks down the starch into oligosaccharides, which are then broken into glucose molecules by adding the enzyme glucoamylase, known also as "γ-amylase". Glucoamylase is secreted by various species of the fungus Aspergillus; the enzyme is isolated from the liquid in which the fungus is grown. The glucose can then be transformed into fructose by passing the glucose through a column that is loaded with the enzyme D-xylose isomerase, an enzyme that is isolated from the growth medium of any of several bacteria. Corn syrup is produced from number 2 yellow dent corn. When wet milled, about 2.3 litres of corn are required to yield an average of 947g of starch, to produce 1 kg of glucose or dextrose syrup. A bushel (25 kg) of corn will yield an average of 31.5 pounds (14.3 kg) of starch, which in turn will yield about 33.3 pounds (15.1 kg) of syrup. Thus, it takes about 2,300 litres of corn to produce a tonne of glucose syrup, or 60 bushels (1524 kg) of corn to produce one short ton. The viscosity and sweetness of the syrup depends on the extent to which the hydrolysis reaction has been carried out. To distinguish different grades of syrup, they are rated according to their dextrose equivalent (DE). Most commercially available corn syrups are approximately 1/3 glucose by weight. Two common commercial corn syrup products are light and dark corn syrup. Light corn syrup is corn syrup seasoned with vanilla flavor and salt. Light corn syrup is clear and tastes moderately sweet. Dark corn syrup is a combination of corn syrup and molasses (or Refiners' syrup), caramel color and flavor, salt, and the preservative sodium benzoate. Dark corn syrup is a warm brown color and tastes much stronger than light corn syrup. Molasses in dark corn syrup enhances its flavor and color. Corn syrup's major uses in commercially prepared foods are as a thickener, a sweetener, and as a humectant – an ingredient that retains moisture and thus maintains a food's freshness. Corn syrup (or HFCS) is the primary ingredient in most brands of commercial "pancake syrup", as a less expensive substitute for maple syrup. In the United States, cane sugar quotas raise the price of sugar; hence, domestically produced corn syrup and high-fructose corn syrup are less costly alternatives that are often used in American-made processed and mass-produced foods, candies, soft drinks, and fruit drinks. Glucose syrup was the primary corn sweetener in the United States prior to the expanded use of high fructose corn syrup production. HFCS is a variant in which other enzymes are used to convert some of the glucose into fructose. :808–813 The resulting syrup is sweeter and more soluble. Corn syrup is also available as a retail product. If mixed with sugar, water, and cream of tartar, corn syrup can be used to make sugar glass. ^ "Sugar Association Alternative Carbohydrate Sweeteners". Archived from the original on 23 September 2006. ^ "International Starch Association Starch and Glucose Glossary". ^ "Dent corn" (Zea mays var. indentata) is so called because the tops of its kernels are slightly indented. See Merriam-Webster dictionary. ^ "Enzymatic starch hydrolysis: background". ^ a b "Karo Syrup - FAQ". Karo. ACH Food Companies, Inc. Retrieved 15 May 2015. ^ a b Knehr, Elaine. "Carbohydrate Sweeteners". Virgo Publishing. Retrieved 17 October 2008. ^ "5 Things You Need to Know About Maple Syrup". Retrieved 29 September 2016. ^ "U.S. Sugar Import Program". USDA. Archived from the original on 22 March 2009. Retrieved 21 March 2009. ^ States, National Confectioners' Association of the United (1956). Annual Report - National Confectioners' Association of the United States. 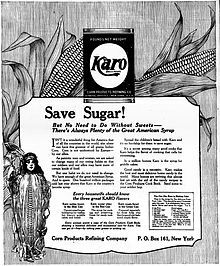 Wikimedia Commons has media related to Corn syrup. This page was last edited on 5 February 2019, at 02:56 (UTC).